Summer time in Vancouver is all about the outdoors. We are so fortunate to be surrounded by the water and nature no matter if you’re exploring by foot, bike or car. 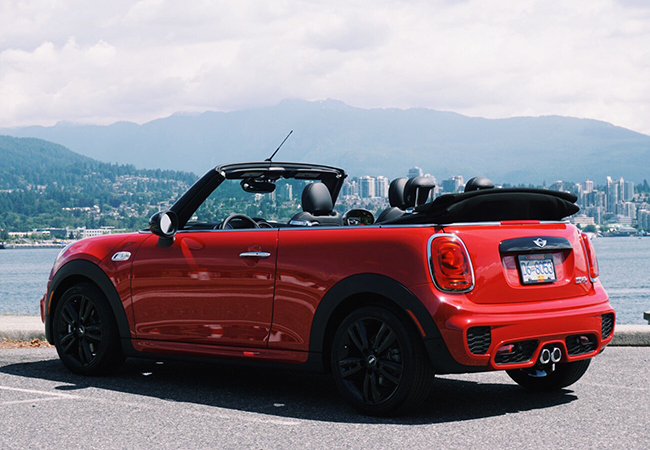 We wanted to share the ‘Top 3 Destinations to Enjoy this Summer Around Vancouver’ as well as a few tips you might not know about your MINI that will make your adventures a walk in the park. The luxury of driving on the Sea-to-Sky Highway to Whistler is all about the view and surrounding nature. Officially known as BC Highway 99, this legendary route from Vancouver to Whistler and beyond is a drive with incredible sights at just about every turn. It's also filled with fun stops, including outdoor destinations, cultural points of interest and historic sites. So grab your map, plot the course and head out for a weekend of adventure along the Sea-to-Sky Highway. Tip #1: It’s a long drive up to Whistler and you wouldn’t want to miss a view point or be distracted. Equipped in your MINI is a state-of-the-art ‘Infotainment System’. The system can spot traffic, link up to your calendar, Spotify, social media apps, and allows you to plan your route up to Whistler so you don’t miss any stopovers along the way. Stanley Park is a staple and an all around great time whether you are driving around the park to enjoy the stunning view of the ocean and nature or if you’re grabbing your bike to ride the seawall. If you have your bike rack installed you’ll definitely have the best of both worlds. It offers spectacular views of the North Shore mountains and Lions Gate Bridge. There are many places to stop and enjoy the scenery or to picnic on the beachside. Tip #2: A huge benefit in owning a new MINI is having access to the wireless phone charging system located inside the armrest. Leave the car cordless and clean while your MINI lets you wirelessly charge any QI-compliant smartphone on-the-go. If you’re just getting off work or you’re looking for a great beach location for your family weekend gathering, Spanish Banks is the place to be. Located along Northwest Marine Drive west of Tolmie Street, Spanish Banks Beach is composed of three distinct sections, east, west, and extension. This area has plenty of free parking and allows for many fun activities all summer long such as: 8 beach volleyball courts, barbeques permitted and picnic tables provided. Tip #3: After a big family trip or just a picnic date at the beach your hands are going to be full. The ‘Automatic Tailgate’ function in your MINI is going to be that extra helping hand. Simply kick under the rear bumper and it’ll trigger sensors to open up the trunk. To learn more about the special features in your MINI, contact our friendly, non-commissioned MINI Motoring Advisors at 604.233.0700 or visit us in-store in Richmond on #338 – 10700 Cambie Road.